Powdered Milk #9-10, by Keiler Roberts. 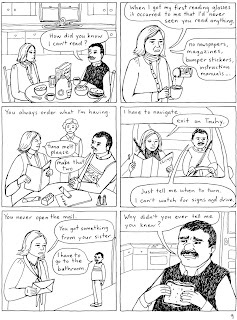 Issue #9 of these strips taken from her website focuses in on more anecdotes about her young daughter during her toddler years. As her husband notes, toddlers are walking joke and anecdote generators, and so in one strip he literally tells Keiler that what their daughter just said will be her next strip. Her mentioning him saying this adds another meta level to the strip, something she's done a few times. The last couple of pages feature Keiler and a friend sitting naked in a hot tub at a day spa, with the talk turning to the attractiveness of each other's breasts and her friend's desire to get her entire body rubbed down. Roberts really captures both the sense of ease with which they talk and acknowledges the awkwardness inherent in their conversation. Issue #10 is all about a film she remembers seeing as a child about a man who didn't know how to read and her present-day extrapolation as to how the story might have continued. When she learns that it was a book, not a film, and that she had misstated some of its elements, she rewrote her extrapolation based on that new evidence. This is a hilarious examination of the perils of memory, especially when one tries to create a narrative based on those memories. Roberts is a witty and pithy cartoonist, and she seems to really be hitting her stride as a memorist who mines humor from her dark and light moments alike. 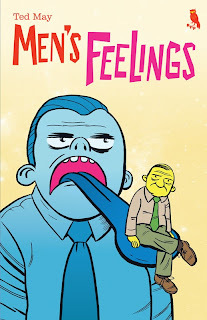 Men's Feelings, by Ted May.May has a knack for delivering sublimely formatted comics and minis. 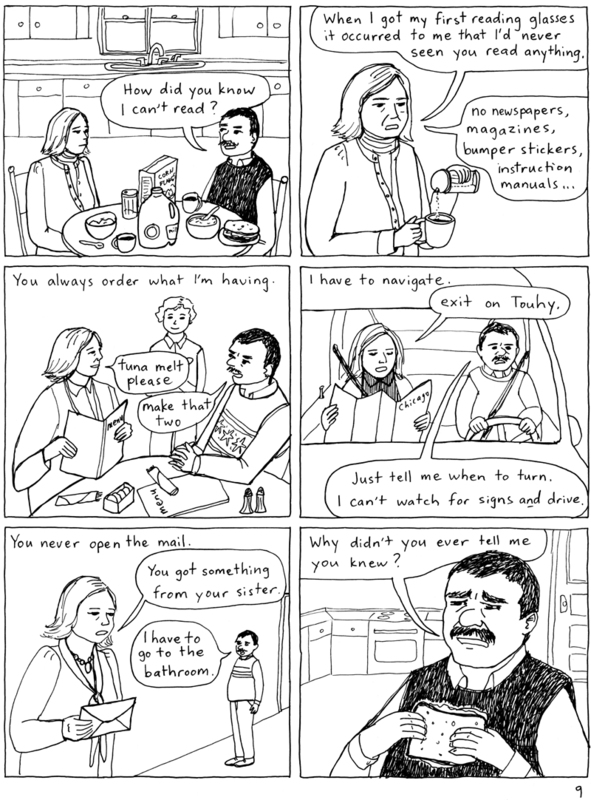 Men's Feelings, a "tears and toilets" comic to use his description, is no exception. Published by Revival House, May is at his best here in depicting the lives of men of varying ages, sending up both their own feelings and how other people view them. For example, "Earthlings" is a hilarious story wherein a number of younger people congregate outside the window of a middle-aged man's house, displaying this football-watching average schlub as though he were in a zoo.May is a master at delivering a lot of information with very little text, and this story is a good example of that. "New Life" is one of those toilet stories, as a guy sits in a coffee shop on top of the world one moment and then on top of a toilet as he has painful diarrhea that seems to last forever, driving him to tears. Another highlight is "Milestones", featuring two guys griping about marriage, children and religion as they stand against a wall at a wedding. When they scatter when they see the priest approaching, it highlights just how toothless their rants really were. "Dimensions" is so knowing regarding the banality of interoffice chatter that it hurts, and I loved the way May inserted the possibility of stopping and literally smelling nature as an almost mystical and incomprehensible act. May is great at depicting schlubs, losers and burnouts, as the band of weirdos in the poker story "Winning" puts on full display. The funniest story is "Token", about a balding man who is constantly choking on all kinds of food until a magician intercedes and the man chokes out a casino token. How magical this man actually is is a central part of the joke. May is an assured storyteller and underrated as a humorist because his stories always have a certain flatness to them that forces the reader to really engage them to see what's really going on, and this mini is a fine example of that humor at work. Jerry's Journal #2 and Me, by Neil Fitzpatrick.I've critiqued Fitpatrick's comics in the past for being too twee. His musings seemed shallow, as he was more interested in a quip than a genuine moment of understanding. With Jerry's Journal #2 and Me, Fitzpatrick took a hard turn into expressing some hard emotional truths as he tried to make sense of an unraveling relationship that nearly wrecked him. Jerry's Journal is full of rage and bile, a righteous feeling of being burned and the desire to somehow get back. Me abandons the pretense of the Jerry character, laying Fitzpatrick and his feelings totally bare. While he never gets at the specifics of the nature of the betrayal that ended his relationship, it's clear that he felt side-swiped and that her attempts at apology seemed halfhearted at best. 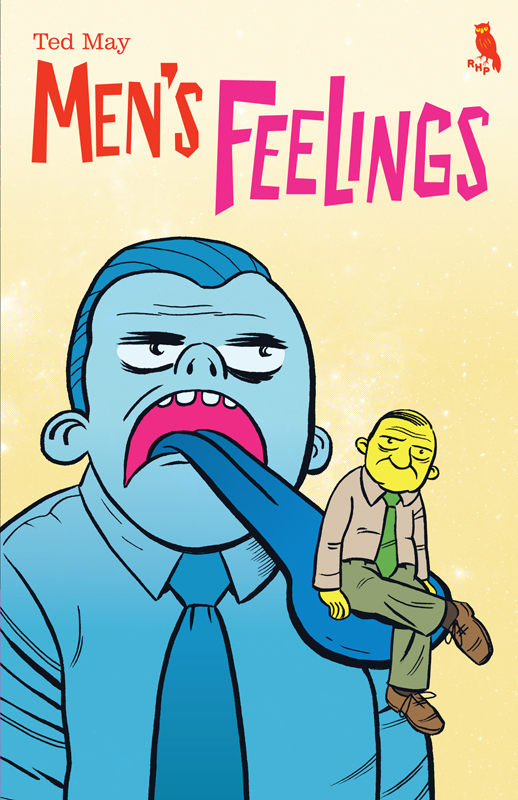 Fitzpatrick goes through a lot of grieving in the pages of this comic, alternating between expressing anger and trying to forge a new life and identity for himself. Of course, stating that he's in a new life and actually living it are two different things, as he lapses back into anger and finally a sense of acceptance by the end. It's a pretty bold experiment to expose his emotions so openly (something he also acknowledges in one of the strips), but it seemed key that this needed to be sent out into the world. These comics are a breakthrough for Fitzpatrick, one that I hope keeps up without the pain and rage that fueled them. Fear of Flowers, by Jason Viola. Viola is generally a gag man, but this trio of stories about cryptic plant behavior is contemplative and philosophical. It also doesn't hurt that his renderings of flowers are beautiful without overwhelming the eye or obscuring his narrative ends. The first story, considering sunflowers mysteriously all turning in one direction when they mature, gets at this sense of the enigmatic quality of nature being overwhelming in the way he renders an entire lea's worth of sunflowers. 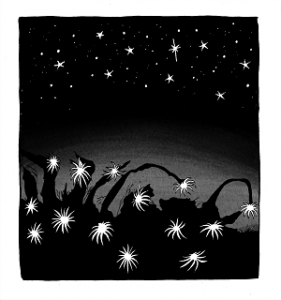 The second story, about a rare flower called a kadupul, discusses the plant's rare and nocturnal blooming pattern, as though it waited until everything around it was absolutely still before flowering and wilting before anyone could see it. Again, the fact that this is unexplained makes it all the more intriguing. Finally, when considering the orchid, Viola holds forth on the topic of mortality and how we never know when we will die. This final mystery in our lives is what largely motivates are actions, whether we acknowledge this or choose to distract ourselves from this fact. Viola then informs the reader that under the right conditions, the orchid can effectively be immortal. It's a clever final bombshell in a mini that's about nature defying our conventions and expectations, one that's well-matched with its drawings.